This easy-to-install kit is packaged as a one (1) piece decal with a unique pinstripe at the outside perimeter as shown. Graphic decal is PRECUT and ready to install in a wide variety of colors (shown in Silver Metallic) - NO TRIMMING required! This stripe package is not just a straight 18" (45.72cm) strip in a box. Our graphic kit consists of a prefitted and contoured piece as shown in the illustration. Rally stripe piece is designed for application on the Sierra's distinct center upper flat area. Includes easy-to-follow general online instructions. 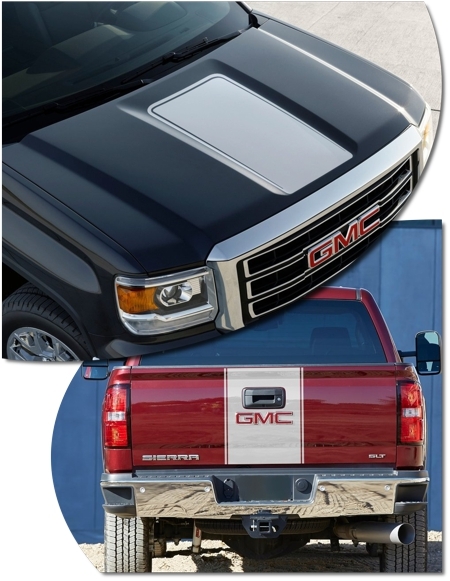 Optional Tailgate Stripe kit available separately. Tailgate strip consists of a 18.45" (46.86cm) wide piece which includes an approximate 0.30" (7.62mm) pinstripe at each side. Gate Handle is precut however factory GMC tailgate lettering requires temporary removal and replacement subsequent to successful application.